Cologne, 15 December 2016 - ArcelorMittal is exhibiting at BAU 2017 in Munich from 16 – 21 January 2017 in the Flat, Long and Construction Products categories (Stand B2.318). In all three segments, it is about presenting new and improved products that benefit users in terms of weight, sustainability and cost. For example, in the Flat Products segment, ArcelorMittal is presenting Indaten®, a corrosion and weather-resistant steel with added copper to make it resilient to climatic influences. Further alloy components are used to increase its tensile strength and improve its forming properties. Whether it is for the Luxembourg Pavilion at World Expo, sound barriers on the Italian A14 motorway, for containers, fences or outdoor equipment – with a thickness range of 0.5 – 80 mm, low maintenance requirements, a life expectancy of more than 80 years and a 100% recycling rate, Indaten® is not only attractive for many fields of application but is also inexpensive, aesthetically pleasing and sustainable. A conference on Indaten® will be held on the stand on Tuesday 17 January at 1 pm. Flat Products is also presenting Granite® Silky Shine and Granite® Silky Mat, two new organically-coated steels with innovative surface textures. Granite® Silky Shine is primarily used for façade systems with a high-gloss, luxurious cladding to lend a unique aesthetic appearance to any building. Granite® Silky Mat is an elegant steel, offering matt textured or smooth surfaces suitable for all façade requirements. In the Long Products segment, ArcelorMittal sets the direction for economic and sustainable construction with its high-strength grade S355 and very high-strength grade S460 for rolled girders. With construction materials like these, it is possible to build with less material and therefore at significantly less cost. By constantly refining the manufacturing process for hot-rolled structural steel, it is now possible to produce rolled sections in grade S355 and above much more economically. Additional cost savings in manufacture, for example through reduced weld thicknesses, only add to the possibilities. For example, more than 1,200 tonnes of grade S355 high-strength rolled beams were used in building the Ferrari Sports Management Centre in Maranello, Italy. Long Products is also presenting its HISTAR® steels, very high-strength structural steels with an excellent toughness at low temperatures, which weld extremely well, due to its improved chemical composition. Up until recently, it was not thought possible that these material properties could be combined. Hot-rolled H-beams in HISTAR® quality make innovative designs and more economical steel structures possible. HISTAR® steels are used successfully in construction projects through-out the world. Long Products is also presenting ARCOROX®, a weather-resistant structural steel grade for rolled sections and merchant bars. Interest in corrosion-resistant steel is once again increasing and it is expected to play an even greater role in the future, because of its aesthetic qualities, sustainability and cost-efficiency. In addition to this, the company is presenting economical and innovative floor solutions: integrated composite floors (Composite Slimfloor Beam – CoSFB) and castellated beams (ACB® and Angelina™). These innovative systems strengthen the position of steel in the construction of multi-storey buildings. With new bridge solutions (PreCoBeam), Long Products offers another innovative option for using steel solutions to advantage in the infrastructure sector. ArcelorMittal Construction is presenting building systems for the building envelopein a wide variety of coatings and colours. These include the Yrysa® coating system with its iridescent shades that interact with light to produce fascinating effects. All ArcelorMittal coating systems fulfil corrosion protection requirements and enable innovative architectural designs. The range of high-quality systems for the building envelope also includes graffiti-resistant varnishes Flontec® and self-cleaning surfaces. 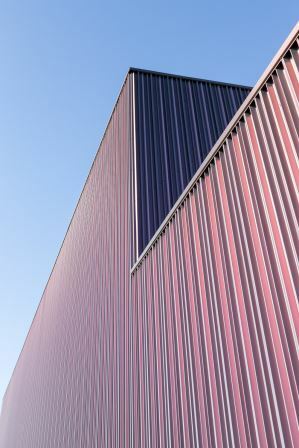 With their high-quality insulating materials and optimum joint tightness, as well as their high static load-bearing capacity, Ondatherm®, Frigotherm® and Pflaum sandwich panels offer tailor-made thermal insulation for industrial applications, commercial buildings and cold stores. Certified fire-resistance classes (up to EI 120), extremely low smoke emission rates (B-s1, d0) and FM Approval Standard 4881 certification set the standard for safe and extremely economical design. With its complete range of trapezoidal steel and cassette profiles, ArcelorMittal Construction meets all the requirements for lightweight steel construction. The new asymmetrical profile Eclectic ® with multiple architectural possibilities to animate façades is presented . For multi-storey buildings, the Cofrastra® and Cofraplus® profile systems offer an economic alternative to conventional floor systems. These tried and tested and building-authority-approved floor systems are characterised by lower ceiling heights, extremely short construction times and valuable added benefits in redevelopment projects. ArcelorMittal can be found on Stand 318 in Hall B2, Stand 318, Bauforumstahl joint stand. Press contact: Arne Langner, arne.langner@arcelormittal.com, +49 221 5729 219. ArcelorMittal, with a production volume of around 7 million metric tonnes of crude steel, is one of Germany’s largest steel manufacturers. Its customers include the automotive, construction and packaging industries as well as the household goods sector. The company operates four large production sites in Germany. These include two integrated flat carbon steel plants in Bremen and Eisenhüttenstadt in addition to two long carbon steelworks in Hamburg and Duisburg. ArcelorMittal also maintains a strong sales network in Germany and has seven cutting service centres as well as 16 distribution centres. ArcelorMittal employs a workforce of more than 9,000 in Germany. For more information, please visit: http://deutschland.arcelormittal.com. ArcelorMittal is the world's leading steel and mining company, with a presence in more than 60 countries and an industrial footprint in over 19 countries. Guided by a philosophy to produce safe, sustainable steel, we are the leading supplier of quality steel in the major global steel markets including automotive, construction, household appliances and packaging, with world-class research and development and outstanding distribution networks. Through our core values of sustainability, quality and leadership, we operate responsibly with respect to the health, safety and well-being of our employees, contractors and the communities in which we operate. In 2015 ArcelorMittal had revenues of $63.6 billion and crude steel production of 92.5 million tonnes, while own iron ore production reached 62.8 million tonnes. For more information about ArcelorMittal please visit: http://corporate.arcelormittal.com/.